Toyota today is one of the biggest brands at the Dakar Rally - thanks to Toyota Gazoo South Africa and Overdrice Racing Belgium with their superb Toyota Hilux Pickups. But fans of the Dakar know: Next to many privateers with many different Toyotas there is another Toyota Factory Team: Toyota TLC Auto Body from Japan. But the Japanese have a big difference to the Hilux: They are competing with nearly serial Toyota Land Cruiser in the T2 production class. And are winning in this class since years - if there are no faster Toyota Land Cruiser like for example from Xavier Foj. In the past years the Autobody-Land Cruiser were mostly driven by Japanese crews. Since last year, the Team is French-dominated. 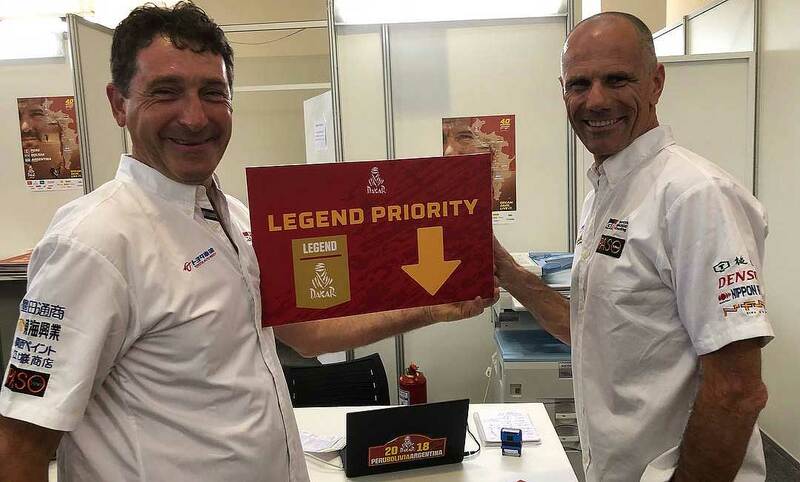 Like in 2017, the first Toyota Landcruiser 200 with V8 biodiesel 1VD-FTV engine will be driven by the French Christian Lavieille and Jean-Pierre Garcin, the second car will be piloted by Akira Miura from Japan and navigated by the French Laurent Lichtleuchter. A great combination: Last year the two Toyotas could finish the T2 production class as winner and 23rd overall (Lavieille) and vice-winner (Miura, 24th overall). Lavieille is a really Dakar- and Rallyraid-expert. For many years he drove with Nissan, in the Transsyberia Rally with Porsche, two years with the Chinese make Great Wall or also for Renault Argentina. Jean-Pierre Garcin has raced with Toyota since 2000 and has achieved great success with 6 victories in its category. Akira Miura first participated in the Dakar in 2007 appearing many times as a navigator and drove the rally for the first time in 2016, overall earning victories in his class twice all while working his regular job at Toyota Auto Body. This will be his third year driving with navigator Laurent Lichtleuchter. The main goal for both teams is clear: To repeat the double victory of 2017. "We will have to approach the beginning of the race in the best way, and especially try not to stuck in the sand," the Christian Lavieille said, knowing that their Toyotas are not the lightest. "There will be many beautiful dune stages - in a landscape you dream of!"